The U.S. Navy is planning sea trials for a weapon that can fire a low-cost, 23-pound (10-kg) projectile at seven times the speed of sound using electromagnetic energy, a “Star Wars” technology that will make enemies think twice, the Navy’s research chief said. Rear Admiral Matthew Klunder, the chief of Naval Research, told a round table group recently the futuristic electromagnetic rail gun had already undergone extensive testing on land and would be mounted on the USNS Millinocket, a high-speed vessel, for sea trials beginning in 2016. “It’s now reality and it’s not science fiction. It’s actually real. You can look at it. It’s firing,” said Klunder, who planned to discuss progress on the system later on Monday with military and industry leaders at a major maritime event – the Sea-Air-Space Exposition – near Washington. The Navy research chief said that cost differential – $25,000 for a railgun projectile versus $500,000 to $1.5 million for a missile – will make potential enemies think twice about the economic viability of engaging U.S. forces. U.S. officials have voiced concerns that tight defense budgets could cause the Pentagon to lose its technological edge over China, Russia and other rivals, who have been developing antiship ballistic missile systems and integrated air defenses capable of challenging U.S. air and naval dominance. Weapons like the electromagnetic rail gun could help U.S. forces retain their edge and give them an asymmetric advantage over rivals, making it too expensive to use missiles to attack U.S. warships because of the cheap way to defeat them. Railguns use electromagnetic energy known as the Lorenz Force to launch a projectile between two conductive rails. 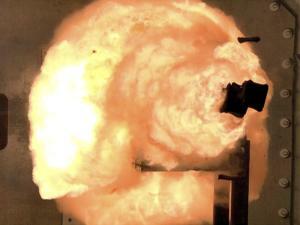 The high-power electric pulse generates a magnetic field to fire the projectile with very little recoil, officials said. 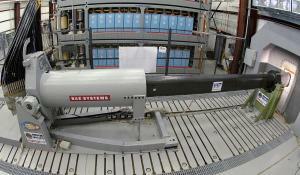 The U.S. Navy has funded two single-shot railgun prototypes, one by privately held General Atomics and the other by BAE Systems. Klunder said he had selected BAE for the second phase of the project, which will look at developing a system capable of firing multiple shots in succession. 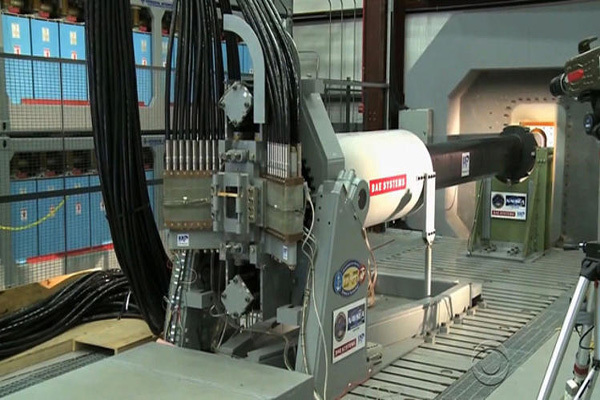 Current projectiles leaving a railgun have a muzzle energy of about 32 megajoules of force, said Rear Admiral Bryant Fuller, the Navy’s chief engineer. He said one megajoule would move a one-ton object at about 100 mph. “We’re talking about a projectile that we’re going to send well over 100 miles, we’re talking about a projectile that can go over Mach 7, we’re talking about a projectile that can go well into the atmosphere,” Klunder said. Ships can carry dozens of missiles, but they could be loaded with hundreds of railgun projectiles, he said. “Your magazine never runs out, you just keep shooting, and that’s compelling,” Klunder said. The 2016 sea trials will be conducted aboard the joint forces high-speed cargo ship because it has the space to carry the system on its deck and in its cargo bay. Officials said they would begin looking at integrating the system into warships after 2018.